Hollybeary Creations : My Sweet Petunia & RAH Blog Hop!! My Sweet Petunia & RAH Blog Hop!! Happy Tuesday everyone.. I hope you had a great Holiday Weekend!! 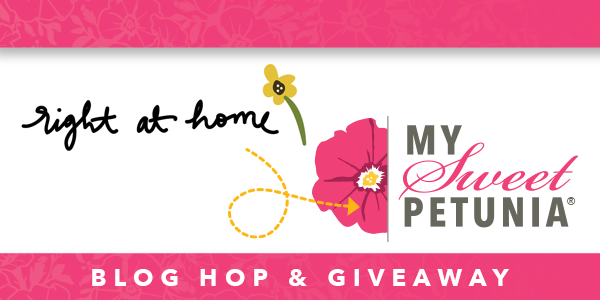 We're starting the week off with a Fun Blog Hop between the Right at Home Team and My Sweet Petunia. Stay tuned at the end of the post for all the details on how you can Win a MISTI and a Prize Pack from Right at Home. My project features the Gorgeous new Anemone Set and it's coordinating dies from Right at Home. My mini Misti is well loved as you can see. I started with an A2 size card base and I added some Salty Ocean Distress Oxide ink to the upper half with a mini ink blending tool. Then I stamped the sentiment from the Right at Home Script Greetings set in VersaFine Black Onyx Ink. I set the card base aside to dry a little. I stamped each of the flowers and the leaves onto some Neenah Solar White card stock using several shades of Inks from Altenew with the Mini MISTI. Then I cut them out with the coordinating dies. I adhered them to card base using some foam tape for the flowers. I adhered the leaves directly to the card base with some liquid glue. 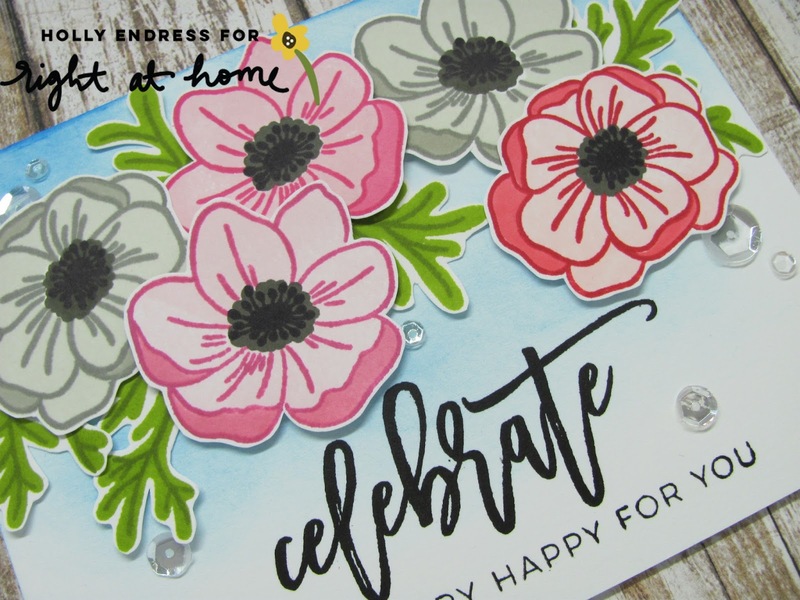 The MISTI is a great tool when lining up sentiment and layering stamps. It's also great if you stamp and miss a spot, you can re-stamp it perfectly each time. I wanted a little sparkle so I added some Mixed Sparkling Clear Sequins from Pretty Pink Posh. A Huge Thank you to MY Sweet Petunia for providing the Right at Home Team with MISTI's for this hop!!! Are you ready to Hop along for some great prizes and Projects? See the full list below of Hop links or you can Hop over to Jeanna's Blog here, and you should have arrived from Iliana's Blog. We will draw two winners from all the comments on the hop, so please leave a comment on every blog to be eligible to win one of two prizes: Winner's choice of an original or mini MISTI, and a prize package from Right at Home (Sunflower stamp set, Harvest Blessings stamp set (new release) and two Distress Oxide Inks - in Cracked Pistachio and Peeled Paint.). Deadline for comments is September 8th at noon Central, and winners will be posted on the My Sweet Petunia and Right at Home blogs on Tuesday, September 12th. What a gorgeous bouquet of blooms. Love the soft colors loving the card. What a great color combo - love the card! Beautiful card - I just adore the Right at Home flowers! Wow! GORGEOUS creation! Thank you for sharing your technique. Good to see the Misti in action. I've heard SO MUCH about them but haven't gotten to actually get/use one yet. Looks AMAZING! Such a beautiful card! love the stamp set and you have a great design. What precious flowers..... love the misti effect! 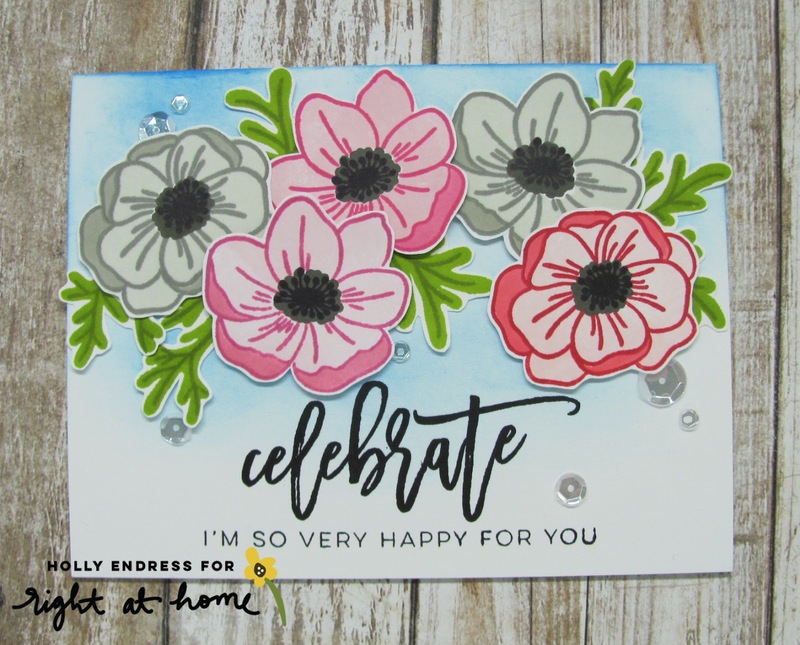 Lovely flowers and sentiment on your beautiful card! Such pretty colors! Thanks for sharing! Thanks for the great tutorial Holly, this is a real beauty! Loving this set. Right at home is new to me! So far the stamps are gorgeous! Such pretty colors! I use my Misti for almost Every card. These flowers are so beautiful! Wonderful job on your card! Lovely card. The soft color palette is nice. These anemone's are so pretty! I love the colors you used for this card, too! The colors of the bloom looks fantastic. Lovely card. What great cards! Thanks for the inspiration. Very pretty card - love these flowers ! Hi Holly! With Anemones like these? who needs friends!!! Just kidding... oh my goodness, so very pretty!!! I gifted a Mini MISTI to my granddaughter who is a beginner stamper - it really helps, at any age, right? Beautiful set of flowers.Beautiful card.Thank You for sharing. The flowers are beautiful and I love the colours you used for your card. Thank you for the inspiration. Wow! Such a gorgeous card!!! What a lovely cluster of flowers! Great card!